“Shodo” where is familiar as for the Japanese. 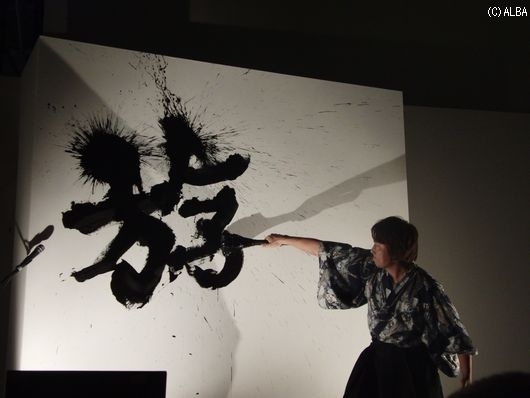 It is Japanese style calligraphy. There are many parents letting a child go to the calligraphy school to be able to write beautiful lettering. However, seeing from foreign countries, “the kanji” is art itself. The kanji has many meanings in one character. Shodo magnifies one kanji character as an image. There are a lot of works created like a picture. I have profundity not to be able to express by the word “calligraphy”. “Shodo” is the traditional culture that accomplished Japan’s original development. The Japanese learns Shodo at school. Shodo is popular by the club activities of the high school recently! Therefore there is not the person who does not know the basics of calligraphy if it is a Japanese. A tool is necessary for “Shodo”. 1 It is “a writing brush” to be the most important. The writing brush for exclusive use of Shodo is made with a weasel, a sheep, the hair of the animal of the horse. When I want to write a powerful letter, I use the hard hair such as a horse and the weasel. And I use the hair of the sheep when I want to write a flexible letter. It is a point to use properly. 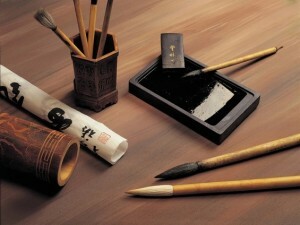 2 It is “an inkstone” and “a sumi” becoming the key to select an atmosphere as to work. As for the image, “inkstone” = “palette” is “sumi” = “material of the ink”. I pour water into an inkstone and I grind a sumi and make a liquid sumi. When children learn it at school, I often use the sumi which has already become into a liquid form. Of the sumi lose it, and, by one and the density of color, the taste of the work changes. “Washi” which is Japanese traditional paper. I can store this paper more than 1,000 years. This Washi contributes to the fact that I can see the calligraphy that an old person wrote. When these three gather, calligraphy is possible. Of course there are a person and cloth to write by hand and the person writing it to the tree without using the writing brush if it becomes professional. But at first the basics of Shodo begin with these three. There are a specialty store and the high-quality thing. But I am easily prepared in a 100-yen shop and stationers. The place where it is pleasant for Shodo to be able to challenge it willingly. It is pleased with the souvenir to the foreign countries! Furin helps us get over summer with its relaxing sounds!